Renovations can be a daunting task, especially if you are doing the renovation yourself. Granted, there will be contractors and licensed professionals at stages along the way, but if you are doing the planning and the prepping (not to mention the budgeting) things can quickly turn sour making you question why on earth you decided to do the renovation in the first place. And where your planning may have included illustrations and floorplans, if the plan was not presented in 3D or in a photorealistic render, the final results may be a bit under the bar when all is said and done. What is BIM and how can it help? BIM is an abbreviation for Building Information modeling. It is a methodology of creating a 3D model of your building and transferring the data to other needed parts of the program, specifically to your floorplans. While you could just have a 3D model made of your renovation, if you are not using BIM technology you are not assured that the model is (1) to scale and that (2) it will actually look like the render. BIM technology works on specifics, meaning that if I want to create a renovation for a 9 foot by 12 foot room, I can design a box of 9 by 12 feet. Additionally, I can add the wall thicknesses and materials which are to be used in that room, texture the wall with the selected paper or paint, input an actual model of an actual window or door, and then I can see the results in real time. It is one thing to look at the floor plans or to have a model and get an estimate, but it is quite another to have the actual cost of materials on hand. 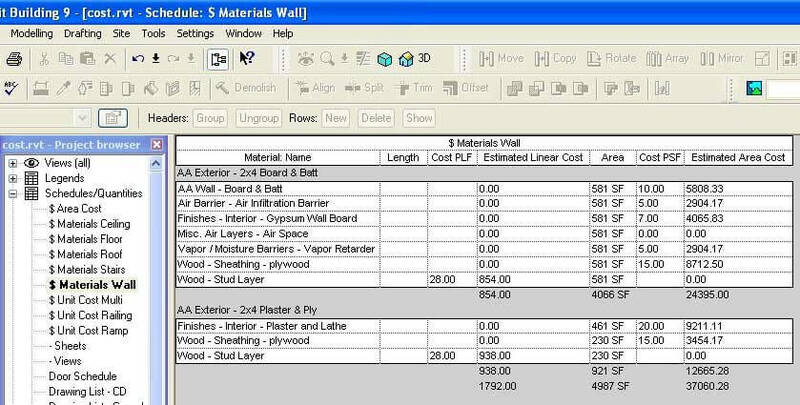 In many BIM technology programs, such as Revit, a material list can be made of all of the components of a renovation. For example: If you add that 2’ by 4’s at your local Home Depot cost 15 per 12 foot board, you can then add that to the material list and then input the total number of boards (which can be done automatically through the program so long as you use a object which is a 2’ by 4’ and not just a box) and get the exact cost for the room. The below example shows such a schedule. With many BIM programs, you are able to see the render as it will be lighted in your actual location. Depending upon the program that is used, you may be able to get as specific as adding in your street address and time into the program to simulate the lighting of the sun through the renders. This method of rendering is greatly beneficial for renovations, especially for renovations such as sun rooms or living rooms where the sun and the lighting of the room by the sun is critical to the layout (I mean you do not want to have a dark sun room or have a sun glare on the television in your living room would you?). In addition to the static rendering, 3D programs allow you to have a number of options to see the renovation project. Walkthroughs, Augmented Reality, panoramas, can all be used as planning your project. Hiring a drafter and designer can be a bit expensive. Generally, a contractor will charge you for the blueprints and you will then have to pay for any changes or revisions done to the renovation. If you are one of those individuals who hired an architect to draw the plans by hand then you may have to pay for a complete new set which can run you into thousands of dollars. The great thing about BIM technology is that you can change your mind cheaply. If you want to have a window moved 4 inches to the right, then all that must be done is to move the 3D window. The program will update all of your sheets, measurements, and such to accommodate for the change, all without having to completely redo your renovation plans. The main benefit of using BIM technology is that you get to see exactly what the outcome of your renovation will be before committing to the project. Yes, you could decide to get a few concepts from an artist, but what happens if you do not like any of the renderings? Do you hire another artist and hope for the best, or do you settle for an illustration that is not really your vision? 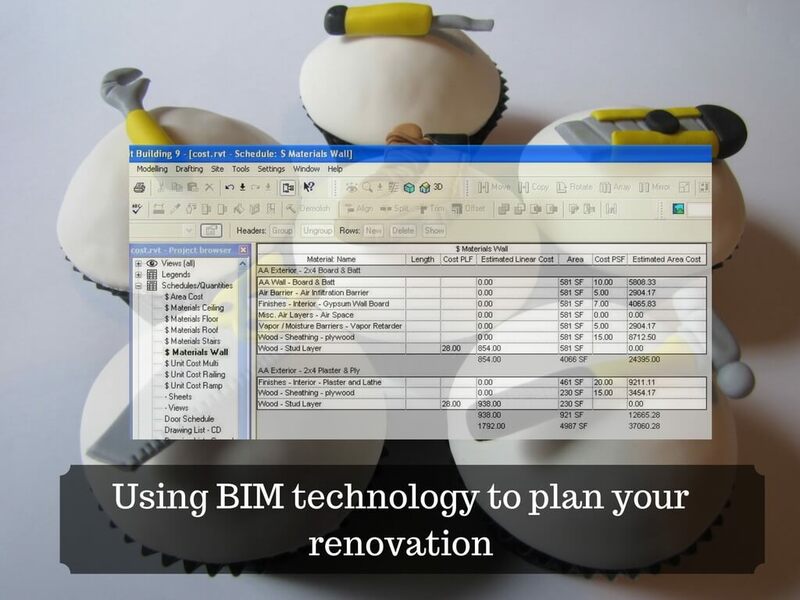 BIM technology allows you to plan the renovation appropriately, find the materials and the cost of the entire project, and then budget and build with fewer surprises. Technology Investment: Where Should You Invest Your Money?